In this volume of Celebrate Broadway we have a collection of numbers that are – for better or worse – novelty songs. They aren’t necessarily life-affirming showstoppers or sultry love ballads. They’re just here to give you a good time. The same good time they gave to audiences when they were first performed. Neil Simon’s musical adaptation (with a brassy score by Cy Coleman and Carolyn Leigh) of Patrick Dennis’s comic novel Little Me starred Sid Caesar in seven different hilarious roles. The show played for 257 performances beginning November 17, 1962, and on that night (according to Women’s Wear Daily) the song “I’ve Got Your Number” “stopped the show for about five minutes while the audience cheered [Swen Swenson’s] lithe dance.” With a title like How Now Dow Jones, who needs a show? That apparently was the problem with this David Merrick musical, which opened on December 7, 1967, and played for 220 performances, thanks mostly to its sizable advance sale. The book was by Max Shulman, the music by Elmer Bernstein, and the lyrics by Carolyn Leigh. However, in the midst of the nonsense on stage was “Step to the Rear,” a genuinely catchy tune and an old-fashioned bona fide showstopper. When Rodgers and Hammerstein’s Oklahoma! was revived on Broadway in 1979 with a bright young cast including Laurence Guittard, Christine Andreas, and Mary Wickes, the show seemed as fresh as ever. And like almost any production of the show, the independently minded Ado Annie (played here by Christine Ebersole) brought down the house with her charming rendition of “I Cain’t Say No.” Lynn Ahrens and Stephen Flaherty’s Once on This Island began its life at off-Broadway’s Playwrights Horizons in the late spring of 1990 where, directed and choreographed by Graciela Daniele, it opened to great critical acclaim. That fall it moved to Broadway’s intimate Booth Theatre where it ran for more than a year. Set in the Caribbean, it told its simple story of love, loss, and redemption with a youthful energy and zest that is all too rarely encountered on Broadway (“Mama Will Provide”). Stuart Ross’s Forever Plaid is a really neat show about a four-part guy group that were on their way to pick up brand new tuxedos when their car was slammed broadside by a school bus. They were all killed instantly and this show is the show they never got to perform while they were alive. Forget trying to figure it out; just listen (and sing along with “Caribbean Plaid”) to the musical that is playing to cheering audiences all over the world. Now remember these are novelty songs. Promenade opened off- Broadway’s Promenade Theatre to critical cheers (Walter Kerr used the word “Hooray!” in his review) on June 4, 1969. It had a score by Al Carmines and book and lyrics by Maria Irene Fornes; the cast included George S. Irving, Alice Playten, Gilbert Price, and Madeline Kahn. The show was offbeat and avant-garde and there hasn’t really been a show like it since then. “Chicken Is He,” featuring the wonderful Florence Tarlow, was typical of the peculiar delights to be found in the show. Jerry Bock and Sheldon Harnick’s work on Fiddler on the Roof is one of the most perfectly integrated scores for a musical ever written. “The Dream” is a perfect example of a fully realized musical theatre sequence. Jerome Robbins’s inventive, witty staging for this number, as well as the distinctive voices of Tony Award® winners Maria Karnilova and Zero Mostel make it one of the high points in one of Broadway’s greatest musicals. New Faces of 1952 was the fifth in Leonard Sillman’s series of revues (there were eight in all). It opened on May 15, 1952, and played for 365 performances. These shows were a chance for rising young composers, lyricists, and performers to reach a wider audience than the small cabarets of New York City. Among the new faces in this edition were Alice Ghostley, Paul Lynde, Eartha Kitt, and Carol Lawrence. This show-stopping “Lizzie Borden” was written by Michael Brown and predates Sweeney Todd by 27 years. The thirty-year collaboration of John Kander and Fred Ebb (including such shows as Cabaret, Chicago, and Kiss of the Spider Woman) was celebrated in the revue And the World Goes ’Round. This show successfully mined the song catalog of this popular team and introduced audiences to songs that they may not have heard before from some of their lesser-known shows. “Arthur in the Afternoon” is from The Act, which starred Liza Minnelli. Here it is sung by the delightful Karen Ziemba who makes the song her own. 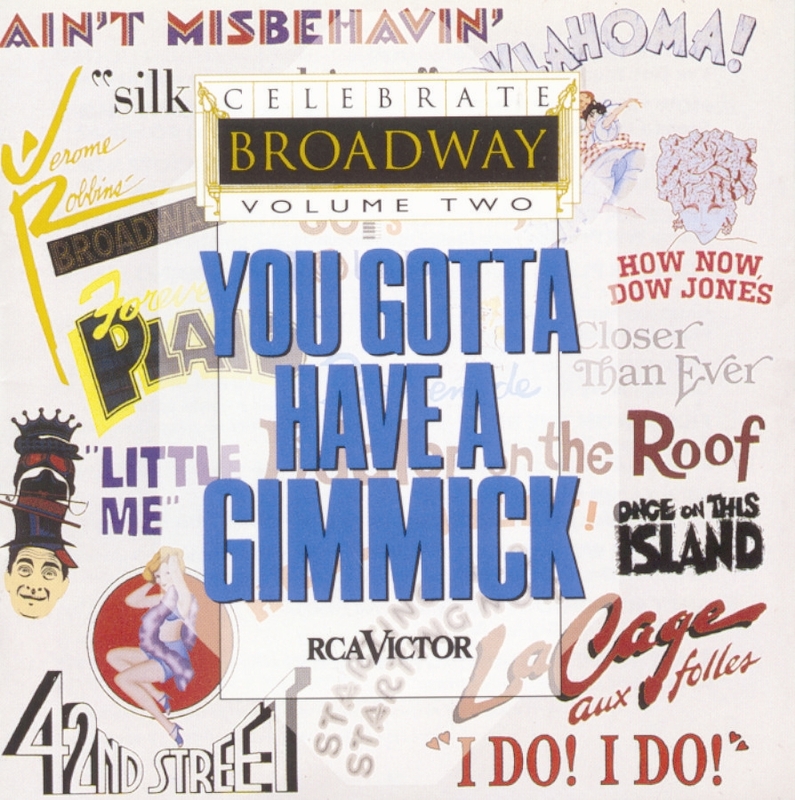 Ain’t Misbehavin’ was the surprise musical hit of the 1977–78 Broadway season. It began life off-Broadway at the Manhattan Theatre Club, then opened on Broadway on May 9th, 1978, and ran for 1,604 performances, winning three Tonys® including Best Musical. The show (devised by Richard Maltby and Murray Horwitz) salutes the songs and spirit of Fats Waller and stands as a model of what musical revues should be. Its remarkable ensemble cast included Armelia McQueen, Charlaine Woodard, Andre De Shields, Nell Carter (in the performance that won her a Tony Award®), and Ken Page. Here Mr. Page has a star turn with his hilarious rendition of “Your Feet’s Too Big.” Richard Maltby was the co-author as well as the director of Starting Here, Starting Now, a revue of songs he had written with composer David Shire. The show opened off-Broadway (after playing at the Manhattan Theatre Club) on June 19, 1977, and played for 120 performances. However, thanks to the original cast recording, the show has had an extended life in regional theatres throughout the world. “Crossword Puzzle” provides a delightful showcase for the clever work of Messrs Maltby and Shire and the wonderful talents of Loni Ackerman. Two of Broadway’s greatest stars, Mary Martin and Robert Preston, teamed up for I Do! I Do!, the two-character musical adaptation of Jan DeHartog’s The Fourposter. The score was by Tom Jones and Harvey Schmidt (authors of The Fantasticks) and was staged by Gower Champion. Mr. Preston won a Tony® for his portrayal of Michael and stopped the show nightly with this chauvinistic song and dance (“A Well-Known Fact”). David Merrick’s song-and-dance extravaganza 42nd Street opened on Broadway on August 25, 1980, where it played for 3, 485 performances. The opening night of the show was one of the more dramatic in Broadway history due to the death of director/choreographer Gower Champion earlier in the day. Producer Merrick kept the death a secret until the curtain call and told a stunned audience the news. The result: another Merrick show makes front-page news all over the world and Broadway has a new smash hit. In an evening of show-stopping songs, Carole Cook and Joseph Bova provided Broadway audiences with this delightful rendition of a perennial favorite, “Shuffle Off to Buffalo.” Silk Stockings was Cole Porter’s last Broadway show. It opened after a torturous (lots of firings and hirings) pre-Broadway tour on February 24, 1955, and ran for 477 performances. It starred Don Ameche and Hildegard Knef and was based upon the popular Greta Garbo film Ninotchka. While “Siberia” may seem politically incorrect now, it is no less delightful than it was back then. Maltby and Shire teamed up again in 1989 for another highly acclaimed revue, Closer Than Ever. It added twenty-five more songs to the repertoire of this talented team. “Another Wedding Song,” however, was written by Mr. Shire and his wife, actress Didi Conn, to sing at their wedding. It is an appropriate antidote for those of you who might have grown tired of “Sunrise, Sunset.” By the time Pearl Bailey opened in Hello, Dolly! on Broadway, the show had already played 1,597 performances. Overnight a four-year-old show became Broadway’s newest smash hit. Ms. Bailey even won a special Tony Award® for her performance in this quintessential musical comedy. Dolly went on to run for three more years, closing on December 26, 1970, with Ethel Merman in the starring role. In the tradition of Jerry Herman’s larger-than-life musical-comedy heroines comes Albin/Zaza in La Cage aux Folles (“A Little More Mascara”). The show, which opened on August 21, 1983, and played for 1,761 performances, served as a reminder what good old-fashioned American musical comedy know-how could serve up when all involved decided to collaborate. The result was a tuneful, funny, and moving evening that, thanks to Mr. Herman’s score, Harvey Fierstein’s book, and the careful guidance of Arthur Laurents’s direction, only gets better with time. And now the title song of this collection. Whether this great Jule Styne/Stephen Sondheim number is performed in context in the show Gypsy, or just as a novelty number as it was in the Tony Award®-winning Jerome Robbins’ Broadway, it stops a show cold. Just listen to these three terrific women, Faith Prince, Debbie Shapiro, and Susann Fletcher, and you can hear why Broadway is indeed something to celebrate. In this volume of Celebrate Broadway we have a collection of numbers that are – for better or worse – novelty songs. They aren’t necessarily life-affirming showstoppers or sultry love ballads. They’re just here to give you a good time. The same good time they gave to audiences when they were first performed.